This cookbook is written especially for children and offers more than recipes. Instructions on how to prepare Kosher snacks and meals are incorporated into a story about Hannah and Hershel, twins who sail up the Mississippi River with their grandmother. Tour Acadiana and visit the soul of Cajun territory: Lafayette, St. Martinville, New Iberia, Bayou Lafourche, and other bayou country locales. The authors highlight important cultural notes about each stop and provide Kosher recipes that authentically duplicate the celebrated flavors of each area of south Louisiana. Hardcover. Blend a dash of Kosher with a pinch of Creole and you have the Kosher Creole Cookbook. The authors have combined two famous culinary traditions: the Creole—a blend of certain aspects of French, Spanish, African, and American cooking—and the Jewish, dating from biblical times. Hardcover. Of all the regional cooking in this country, nothing beats the down-home Southern variety. Even the names of the recipes make your mouth water: Sumter’s Succotash, Revival Veal Ribs, Miss Lou’s Fried Grits, Prissy’s Peanut Soup, Cajun Duck Jambalaya, and Yankee Go Home Cocktail. But what about Olde Southern Kosher Kornbread, Shavuot Potato Shissel, or Kugel mit Roshinkes? That’s Southern cooking, too—Kosher style! Whether you are a native New Orleanian, a newcomer, or a visitor to the Crescent City, satisfy your craving for “la bouche Creole” (the Creole taste) in your own kitchen with the help of well-known Creole chef Leon Soniat, Jr. Hardcover. Chicken and Hot Sausage Filé Gumbo, Sauce Piquante, and Sausage, Ham, and Chicken Jambalaya have been dietary staples in New Orleans homes for generations. In La Bouche Creole II, the recipes listed above, as well as many others not included in the first book, are gathered for the first time. Hardcover. Cajun cooking is a melting pot of flavors. From gumbo simmered all afternoon on the stove to Jambalaya aux Ecrive (Crawfish Jambalaya) to sweet pralines for dessert, the recipes of La Cuisine Cajun reflect the creative Cajun tradition. Mrs. Simms Fun Cooking Guide is written for the economical cook and the relaxed hostess. Many of these tempting recipes can be prepared ahead of time and chilled until time to pop them in the oven or carry them to the dining table. Whether you are cooking for two or a crowd, Myrtle Landry Simms makes cooking New Orleans Creole and Louisiana Cajun country dishes—as well as traditional menus—easy, fun, and best of all, delicious! In French. Hardcover. A bestseller since it was first published in 1983, this guide to Louisiana cuisine features the best of the state’s distinctive and rich culinary traditions. Author/chef Jude W. Theriot, CCP, offers more than six hundred recipes representing a comprehensive picture of the culinary arts and cuisines of Louisiana. The first Creole cookbook ever written, Lafcadio Hearn’s Creole Cook Book is an intriguing look into the customs and habits of the Creole home of the 1870s and 80s. Hardcover. With these recipes you’ll be ready to host a proper “fais-do-do” just like those who do it best!! Direct from the kitchen of this acclaimed radio personality, columnist, food consultant, and cooking teacher, Live! From Marilyn’s Kitchen is a sparkling collection of diverse and exciting recipes served up in a conversational style rich in culinary insight and stovetop wisdom. Hardcover. Glamorous and glitzy, historic and classy, fast and flavorful, Los Angeles has it all. 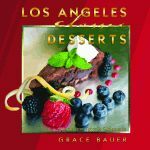 This collection of fifty favorite dessert recipes from the city’s most iconic restaurants past and present showcases all the sweetness and sparkle that makes the L.A. restaurant scene one of the finest in the world. Now home chefs and world-class gourmands alike can enjoy the Tres Leches Cake from Ciudad, Frozen Key Lime Soufflé from Xiomara, Red Velvet Cake Pudding from Water Grille, and dozens more. Much more than paella, flan, and empanadillas (meat pies), Isleño cuisine reflects the diverse heritage of Louisiana. The ingredients combine to produce a healthy menu of more than 800 dishes that range from Irish Stew and a Chow Mein Hot Dish to Chicken Cacciatore and a New England Boiled Dinner. Spiral. From the roast beef poor boys at Acy’s Pool Hall, to enchiladas with fresh ranchero sauce at Castillo’s, and pancakes of many varieties at Bucky Forty-Nine, this volume takes a bite out of New Orleans’ legendary dining scene. Authors Peggy Scott Laborde and Tom Fitzmorris reminisce about some of the best former eateries from around the city. They even include forty of their favorite recipes. Food critic Fitzmorris rates each restaurant on a five-star scale. The city of New Orleans has produced some of the finest chefs in the world. The only American city to boast its own distinct cuisine, it has spread the Creole word through the hands of master chefs—and Louis Evans was one of the best. Executive Chef of the Caribbean Room at the famous Pontchartrain Hotel for 18 years, and former Chef at the popular Kabby’s restaurant at the New Orleans Hilton, Evans served what some believe to have been the best Creole dishes in New Orleans for over 20 years. His years of expertise have been drawn upon here to present Evans’ own collection of recipes—no secrets withheld or details left out. Hardcover.